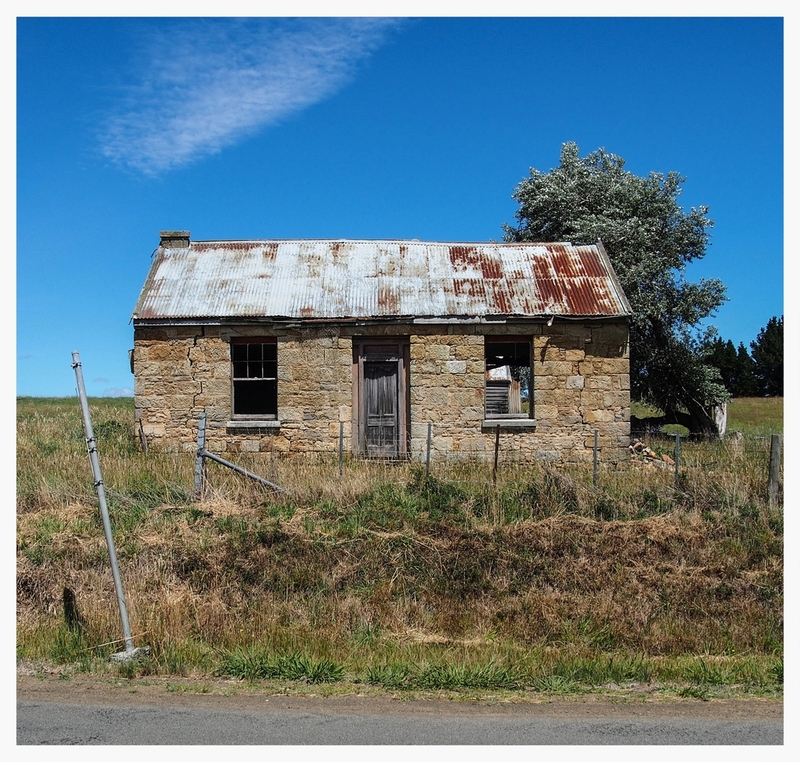 Small abandoned houses dot the roadside on the way from the tiny Tasmanian towns of Sorell to Oatlands. There are many more abandoned cottages throughout the Midlands of Tasmania. This area was settled by Europeans in the early 1800s, when land grants were given to pardoned convicts and newly arrived immigrants from the British Isles. These little houses were once small two or three room cottages. Their stages of dilapidation range from silver weatherboards with memories of paint, to petrified splinters of framing and chimney stacks, naked and exposed. We look at these cottages, and their abandonment is tantalising. They evoke a morbid fascination in us; long lost dreams and stories of struggle which we feel insulated from in the modern world. There is much interest in abandoned places and buildings, and many websites and careers have been devoted solely to their study and exploration. But how should we think about these residential ruins on the side of the road? The first forms of shelter the settlers built were simple dirt floor split slab huts. These were roofed with stringy bark or shingles. One man could build a decent house in three weeks. Some were white washed in a basic expression of house pride. These very early houses do not survive, having been dismantled when a better house was built, or rotting away quickly once abandoned. The long empty cottages that now stand are their primitive successors. Rather than being representative of a spent dream, this form of humble property ownership was for many, a dream come true. Most of the houses were abandoned for newer, larger houses, rather than left to rot due to failure. The little houses represent the first freehold property settlers ever owned. This would not have been possible for people of their low station in England. It was a dramatic improvement to their prospects, and their quality of life. The promise of land ownership was what drew poor English free settlers to our hostile, alien land on the other side of the world. and no one can give me notice to quit, and that’s another comfort. The same farms and their modern homesteads still dot the landscape, perhaps not large or lucrative, but certainly not abandoned or empty. The shells of their predecessors are not examples of long ago failure. Rather, they embody the human urge for security and self determination that property ownership can provide. Perhaps many renters who live in Melbourne, Sydney or any large cities now can relate to this longing.